Please have a look at the pools swimmers like you may have reported near Croatia. Please, report any Croatia Swimming Pool not listed here. Going to a Croatia Swimming Pool is increasing specifically within the elderly population sectors of Croatia, who have suffered some kind of muscle or bone damage. Regular users with the following Croatia Pools told us one of the most important thing about swimming would be to control your breathing. Often this is not achievable because we raise the neck to breathe as well as the body just isn't aligned. To avoid this, our head should be aligned with our spine all of the time. Do you know of any Pools in Croatia that should be listed here? Contact us!. Please contact the sports center in Croatia to check which activities are becoming offered and their timetables, given that Croatia Pools may possibly have various rules and fares than other places. Are you a normal swimmer? Have you ever practiced Aquagym in Croatia? Let us know!. There are many factors why you must choose a heated swimming pool in Croatia. The most crucial one relies on the significance of keeping the body temperature stable. When the water is as well cold, your body will try to warm it up and you will lose strength to swim appropriately. Enjoy the best indoor pools in Croatia and don't worry about the weather. These facilities are open all seasons and you can enjoy a swim at the same temperature every day of the year. Swimming can be a excellent thought to keep your body active throughout your visit to Zagreb (Croatia), or even for anybody who is a local. 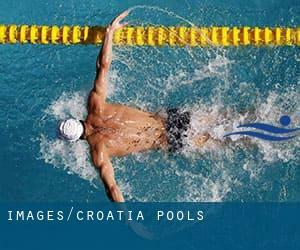 Swimia helps you to find your closest Swimming Pool in Zagreb. Let us tell you a secret to switch off when you happen to be in Zadar: just select a Pool in Zadar and plunge into the water! There's no far more powerful method. Without a shadow of a doubt, swimming in Rijeka would be the ideal way to unwind right after work. Take a couple of minutes to browse Swimia's catalog to find a Pool in Rijeka. Holding an estimated population of 176.314, Split is one of the most important cities in Croatia. Check all the Pool in Split and its surrounding area. It's difficult to visit Croatia without having dropping by Slavonski Brod (with 60.742 residents). Presently Swimia is showing you all the Swimming Pool in Slavonski Brod and the closest pools situated in its vicinity. Kneza Borne 2 , Zagreb (Postal Code: HR-10000). Swimmers like you reported 18 meters, Indoors. Unfortunately we do not have the email address of this Swimming Pool, but we can give you the phone number. Kršnjavoga 1 , Zagreb (Postal Code: HR-10000). Among all of the activities offered by the center, should you be interested in swimming you are going to enjoy 18 meters, Indoors. Just in case you desire to contact this Swimming Pool prior to dropping by, we only know the phone number. A. Smareglia bb , Rovinj (Postal Code: CRO-52210). This sports center gives 25 meters x 14 meters, Indoors. For this Swimming Pool, only phone number is number here. Jarunska 5 , Zagreb (Postal Code: Unknown). Swimmers like you have reported 25 meters x 33 meters, 8 lanes, Indoors. Also, you will find 25 meters x 33 meters, 8 lanes, Indoors. Just in case you need to get in touch with this Swimming Pool just before dropping by, we only know the phone number. Poljudsko šetalište b.b. , Split (Postal Code: 21000). Swimmers like you have reported Olympic size x 25 meters, 8 lanes, 2.2 meters depth, 2.2 meters depth, Indoors. Also, you will find 25 meters x 8 meters, 4 lanes, Indoors. Just in case you need to make contact with this Swimming Pool before dropping by, we only know the phone number.